The list of DTV stations after the June 12, 2009 Digital Transition. Possible relocation of transmit sites. Our studies start with a Computer Run, listing all DTV stations in a 100 mile radius in increasing distance order, computer calculated distances and directions, station affiliations, as well as projected signal levels. The calculated signal levels have taken into consideration the great circle distances to the transmitter, output power of the station, the transmit antenna height above average terrain, assuming omnidirectional transmit antenna radiation patterns, flat terrain, average ground conductivity, and fair weather conditions. However, the predicted signal levels represent only guidelines for the CATV engineer. Significant deviations may occur due to hilly terrain, variation in ground conductivity, dense vegetation, and last but not least, signal levels can be affected by snow and ice deposited on the receiving antenna. ONLY AN ON-SITE SIGNAL SURVEY CAN VERIFY ACTUAL SIGNAL LEVEL AND POSSIBLE INTERFERENCE INTENSITY CONDITIONS. Take a look of a typical computer run. Observe the significant variation in output power. The maximum output power on UHF is 1000 kW. But Channel 42, Odessa and Channel 29, Hobbs operate only with 50 kW, a warning for the antenna design engineer to compensate for the extremely low power. A similar fluctuation is noted in transmit antenna tower height, 1000 ft for Channel 23, Odessa versus 273 ft for Channel 33, Big Spring should not be disregarded either. The Biro Signal Direction Sheets do not deliver new information, but they are efficient visual presentations of the received DTV stations’ dispositions. Data on the Signal Direction Sheets are exact to two decimal places on distances and directions. It is easy to see on the Andrews, Tx. 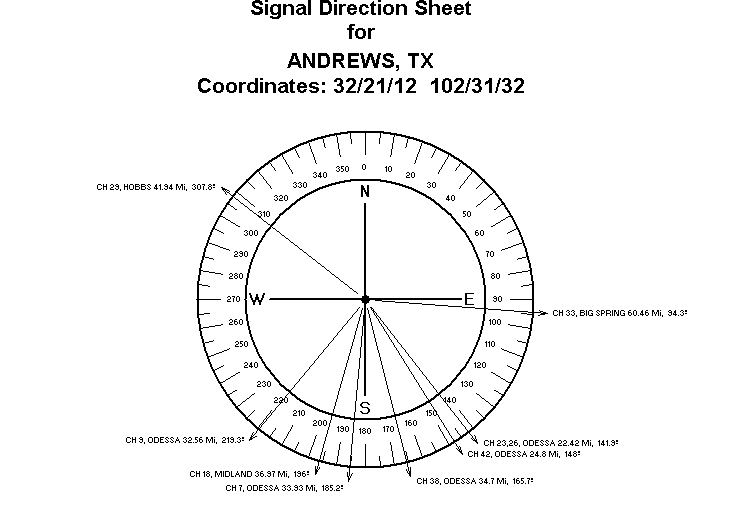 Signal Direction Sheet that a single UHF antenna can pull in three desired stations, Channel 23-26-42, Odessa , The reception of Channel 33, Big Spring , at a distance of 60 miles requires special attention. An Antenna Bill of Materials and Tower Design is an integral part of the Biro DTV Reception Study. The Biro DTV Reception Studies are reasonably priced, and the electronic version is usually available in 24 hours.